I am looking to split a commit up and not sure which reset option to use. 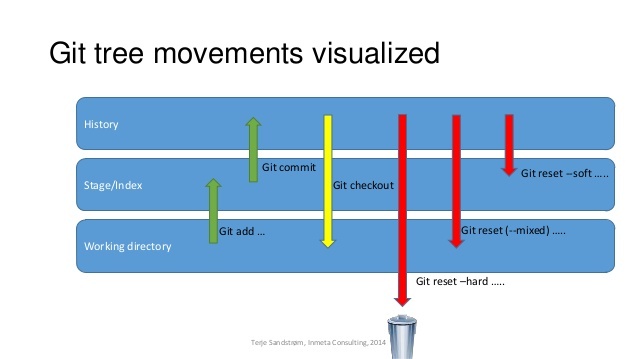 I was looking at the page Can you explain what "git reset" does in plain english?, but I realized I don't really understand what the git index or staging area is and thus the explanations didn't help. Also the use cases for --mixed and --soft look the same to me in that answer (when you want to fix and recommit.) Can someone break it down even more? I realize --mixed is probably the option to go with, but I want to know why. Lastly, what about --hard? Can someone give me a workflow example of how selecting the 3 options would happen? When you modify a file in your repository, the change is initially unstaged. In order to commit it, you must stage it—that is, add it to the index—using git add. When you make a commit, the changes that are committed are those that have been added to the index. HEADpoints to C and the index matches C.
When we run git reset --soft B, master (and thus HEAD) now points to B, but the index still has the changes from C; git status will show them as staged. So if we run git commit at this point, we'll get a new commit with the same changes as C.
Now let's do git reset --mixed B. (Note: --mixed is the default option). Once again, master and HEAD point to B, but this time the index is also modified to match B. If we run git commit at this point, nothing will happen since the index matches HEAD. We still have the changes in the working directory, but since they're not in the index, git status shows them as unstaged. To commit them, you would git add and then commit as usual. And finally, --hard is the same as --mixed (it changes your HEAD and index), except that --hard also modifies your working directory. If we're at C and run git reset --hard B, then the changes added in C, as well as any uncommitted changes you have, will be removed, and the files in your working copy will match commit B. Since you can permanently lose changes this way, you should always run git status before doing a hard reset to make sure your working directory is clean or that you're okay with losing your uncommitted changes. --soft: uncommit changes, changes are left staged (index). --mixed (default): uncommit + unstage changes, changes are left in working tree. --hard: uncommit + unstage + delete changes, nothing left. git reset --soft and --mixed leave your files untouched. git reset --hard actually change your files to match the commit you reset to. In TortoiseGit, The concept of the index is very hidden by the GUI. When you modify a file, you don't have to run git add to add the change to the staging area/index. When simply dealing with modifications to existing files that are not changing file names, git reset --soft and --mixed are the same! You will only notice a difference if you added new files or renamed files. In this case, if you run git reset --mixed, you will have to re-add your file(s) from the Not Versioned Files list. Soft => HEAD only (index and working dir unchanged). Before going into these three option one must understand 3 things. reset --soft : History changed, HEAD changed, Working directory is not changed. reset --mixed : History changed, HEAD changed, Working directory changed with unstaged data. reset --hard : History changed, HEAD changed, Working directory is changed with lost data. It is always safe to go with Git --soft. One should use other option in complex requirement. You don't have to force yourself to remember differences between them. Think of how you actually made a commit. 3.gc -m "I did Something"
Soft, Mixed and Hard is the way enabling you to give up the operations you did from 3 to 1. Soft "pretended" to never see you have did "gc -m". Mixed "pretended" to never see you have did "git add ." Hard "pretended" to never see you have made file changes. Basic difference between various options of git reset command are as below. --soft: Only resets the HEAD to the commit you select. Works basically the same as git checkout but does not create a detached head state. --mixed (default option): Resets the HEAD to the commit you select in both the history and undoes the changes in the index. --hard: Resets the HEAD to the commit you select in both the history, undoes the changes in the index, and undoes the changes in your working directory. --mixed: Just like the soft, this will reset HEAD to another commit. It will also reset the index to match it while working directory will not be touched. All the changes will stay in the working directory and appear as modified, but not staged. The main difference between --mixed and --soft is whether or not your index is also modified. Check more about this here. There are a number of answers here with a misconception about git reset --soft. While there is a specific condition in which git reset --soft will only change HEAD (starting from a detached head state), typically (and for the intended use), it moves the branch reference you currently have checked out. Of course it can't do this if you don't have a branch checked out (hence the specific condition where git reset --soft will only change HEAD). I've found this to be the best way to think about git reset. You're not just moving HEAD (everything does that), you're also moving the branch ref, e.g., master. This is similar to what happens when you run git commit (the current branch moves along with HEAD), except instead of creating (and moving to) a new commit, you move to a prior commit. What's the point of this series of commands? You want to move a branch, here master, so while you have master checked out, you run git reset. The top voted answer here is generally good, but I thought I'd add this to correct the several answers with misconceptions. git reset --soft <ref>: resets the branch pointer for the currently checked out branch to the commit at the specified reference, . Files in your working directory and index are not changed. Committing from this stage will take you right back to where you were before the git reset command. Does what --soft does AND also resets the index to the match the commit at the specified reference. While git reset --soft HEAD does nothing (because it says move the checked out branch to the checked out branch), git reset --mixed HEAD, or equivalently git reset HEAD, is a common and useful command because it resets the index to the state of your last commit. git reset --hard <ref>: does what --mixed does AND also overwrites your working directory. This command is similar to git checkout <ref>, except that (and this is the crucial point about reset) all forms of git reset move the branch ref HEAD is pointing to. It is not useful to say a command moves the HEAD. Any command that changes where you are in your commit history moves the HEAD. That's what the HEAD is, a pointer to wherever you are. HEADis you, and so will move whenever you do. git reset --hard : set your HEAD on the commit you specify and reset all your changes from last commits including un committed changes. What is difference between 'git reset --hard HEAD~1' and 'git reset --soft HEAD~1'? Mercurial: how to undo last unpushed commit? How do you get a specific version from Git in Visual Studio 2015?